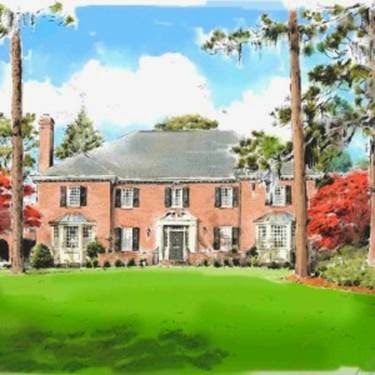 Designer Showhouse - THIS WEEKEND! At 9 a.m. Friday morning this is what was happening... Our stuff everywhere! And not put together at all. By 2 p.m. our room was done! Woohoo! 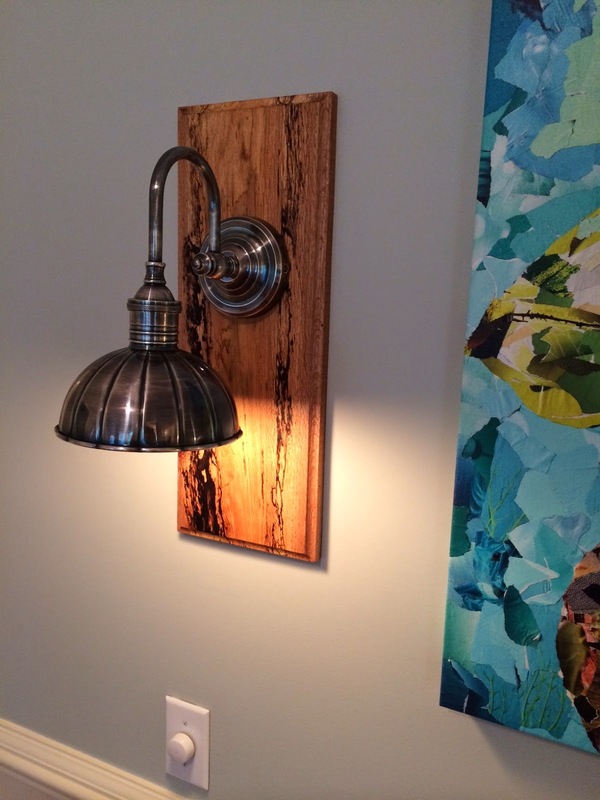 What do you do with a bad 1980's breakfast room fixture? Take it apart (OF COURSE!) 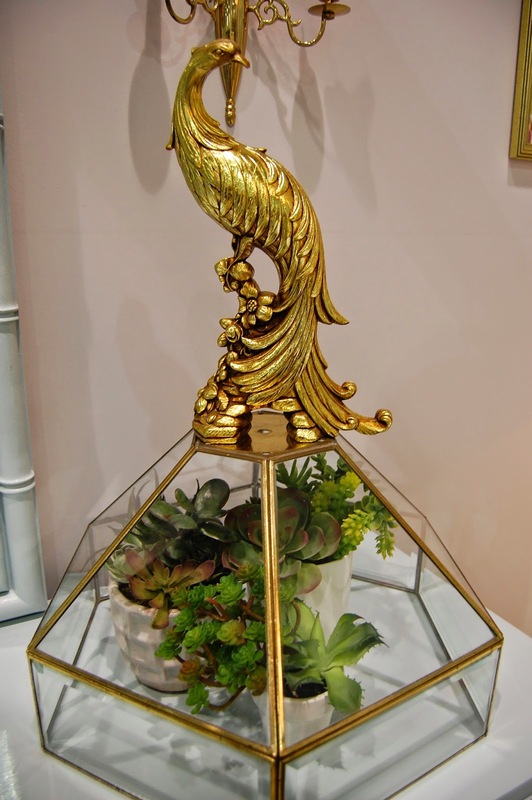 , add a gold peacock and call it a terrarium! 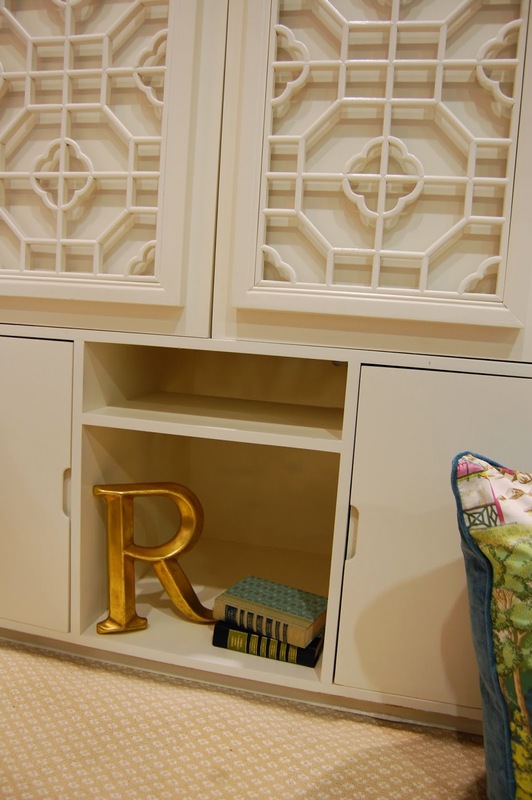 Fret work panels turned this beauty into a glam cabinet! This was our most talked about piece! Botanicals filled these 4 gold frames. We popped them out and framed a Nina Campbell wallpaper sample. 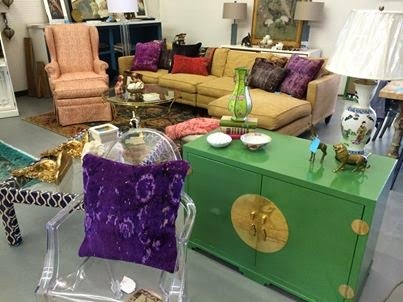 The colors and vibe were dead on for our space! Rojo pulled this cool mod space off with little changes made to what they found. We loved the black walls. (Cue music... I see a red door and I want to paint it black...) The sofa was in insane in the membrane condition... pure vintage goodness! Jenny Wright for McKenzie Baker Interiors wowed us with this bright workspace. 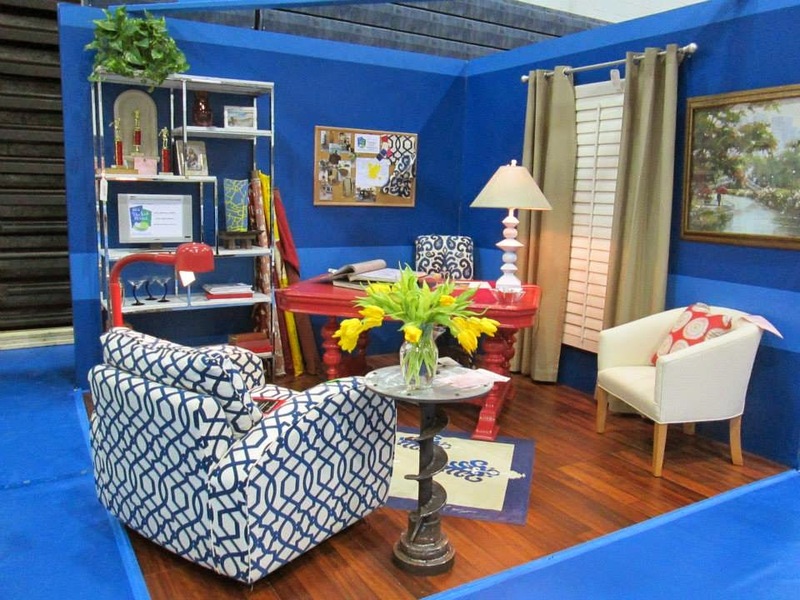 We loved the bold color, pattern and of course wanted to take the chrome shelf to THE COOP! And unfortunately the next room was not allowed to place because they are students, not designers (yet). The Cape Fear Community Collage senior class rocked it out with this garden room. They did not miss a detail and could have easily placed if not won the whole thing! They did get an honorable mention for their creativity! I could add more but these were a sample of our faves! We were truly blown away with what people came up with! 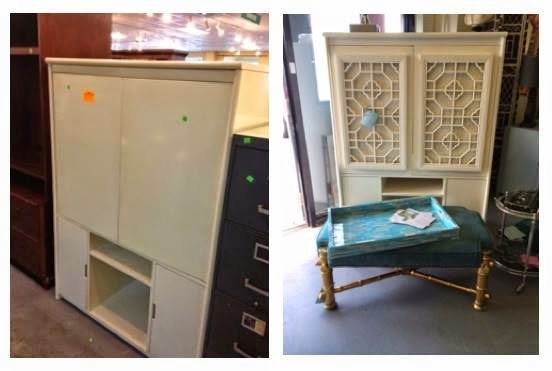 Julie for Custom Furniture Galleries pulled this space off with a very eclectic mix of things from Habitat.We loved the dark wood chest in perfect condition. Good find! Huge shout out to the amazing coordinators of this event. 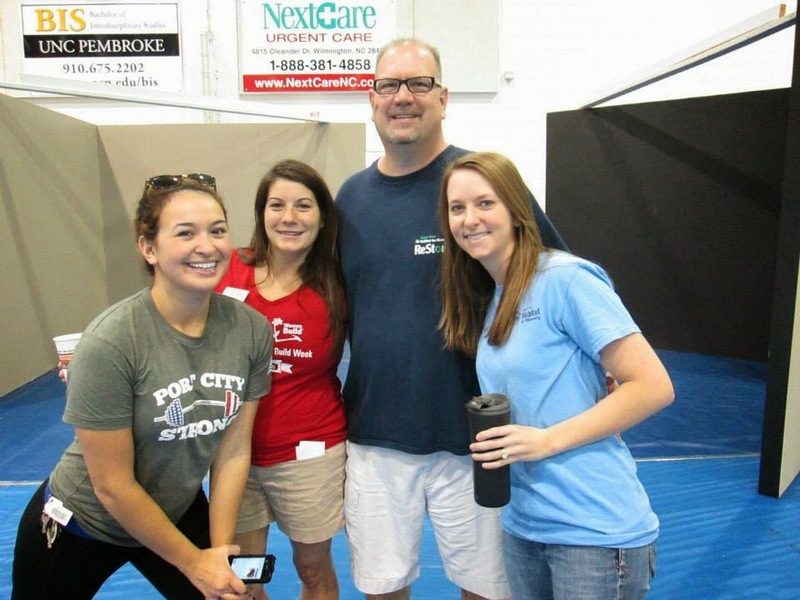 Habitat for Humanity did a great job and put on a fun event! No one told me about jet lag. really. I thought I may be a little off, tired, etc. I didn't think my system would shut down, I would be in some kind of time warp and take my kids to school today only to find out that it is still a holiday. Yes. I 'm that mom. They are thrilled. I. could. cry. 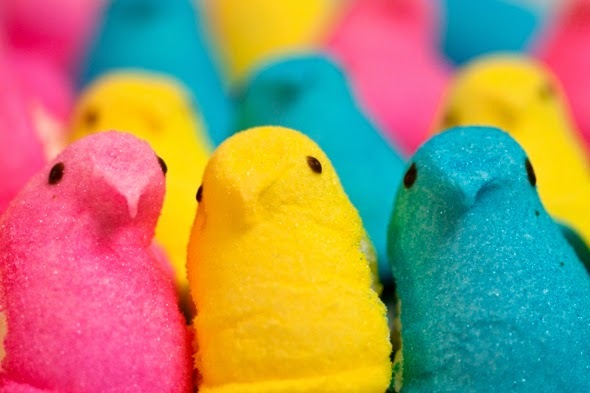 Happy Easter Monday. We just returned from truly one of the best trips of my life. Read was dragging his feet saying things like: Sounds like a lot of work. Are we SURE we want to do this? ... To prove him wrong, I had to make it extraordinary. So today, I am giving myself the award for the best trip planner. Forget the fact that my body still thinks I am in California. We left Friday for San Fran. The plane itself was a blast (for the kids). I honestly think we could have taken them to the airport just to let them ride the escalator and terminal trains and called it a day. Our plan/itinerary: San Fran: Alcatraz, Ghirardelli square, Fisherman's Wharf Carmel: 17 mile drive, Carmel Valley Ranch Drive the Pacific Coast Highway to Los Angeles (seriously saw whales and seals) LA: Universal Studios, Hollywood, Beverly Hills San Diego: Legoland and Zoo Our first stop was the Golden Gate. 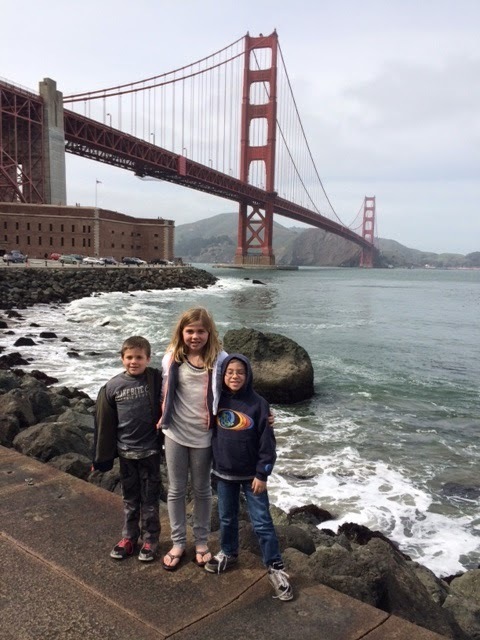 The kids loved seeing the place where Full House was filmed. Seriously? 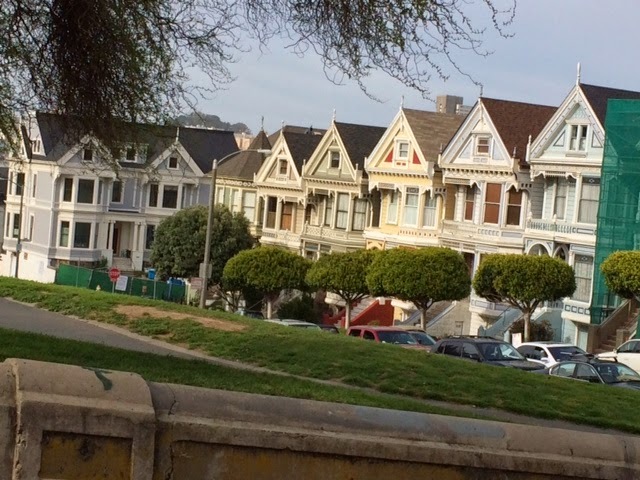 The painted ladies were way cool. 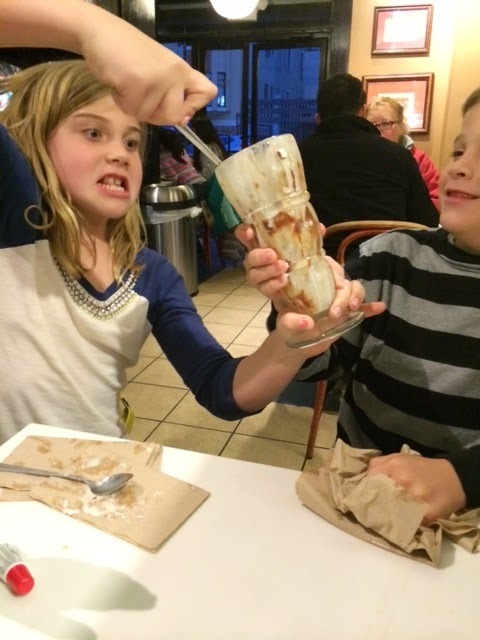 Ghirardelli Square was a big hit. We are still trying to teach her how to share. Once Read got a look a Pebble Beach, he was happy and thought this was the best idea for a trip that HE ever came up with. 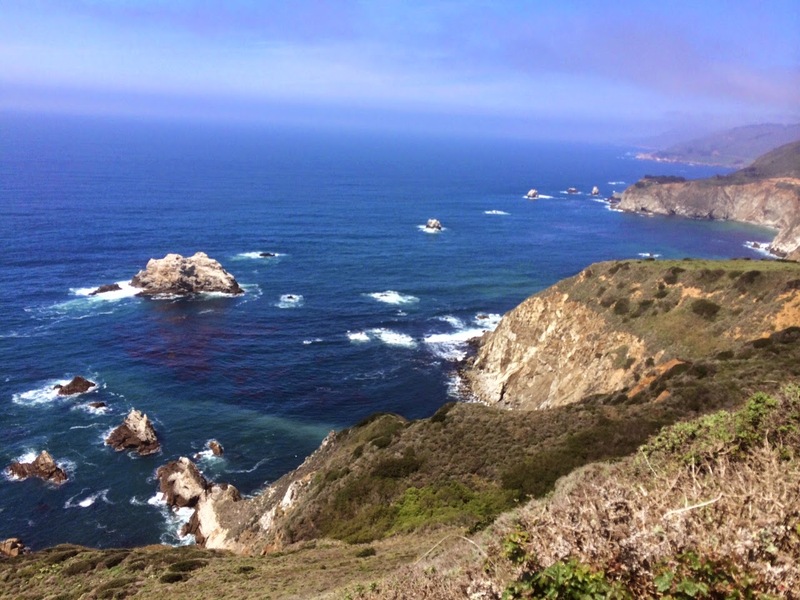 Our drive to Carmel was stunning. 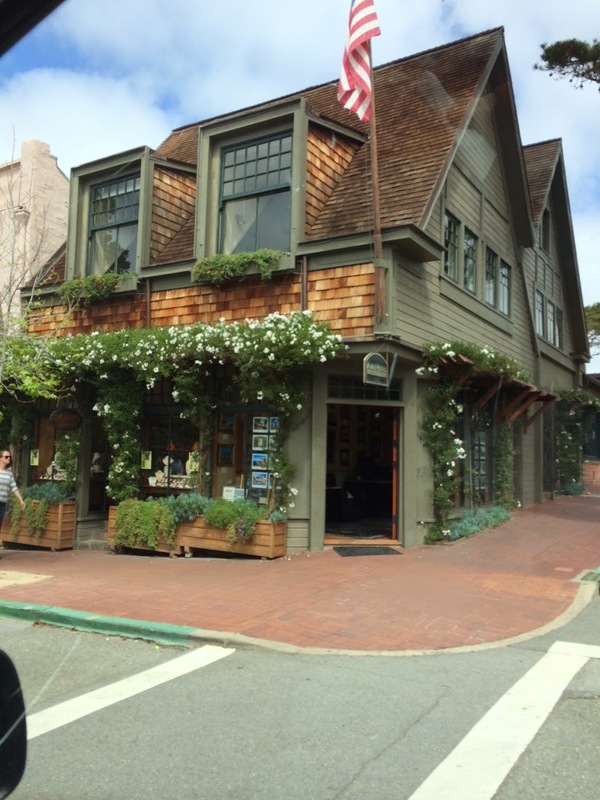 I have deemed Carmel the cutest most perfect town in the WORLD. It is also the most expensive. 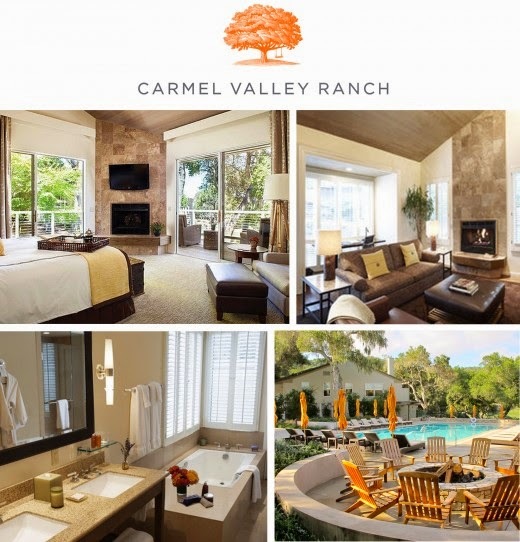 We had a blast at the Carmel Valley Ranch -- I would highly recommend it - very kid friendly too! Kids had s'mores each night by the outdoor fire pits and mama had wine from vineyard. What a week... Round here the wallpaper went up in the Designer Show House, I can add building scaffolding to my reseme', and everything is on it's way to done for the Habitat Upscale Resale event! Remember, EVERYTHING will be for sale at the event! But as for today... 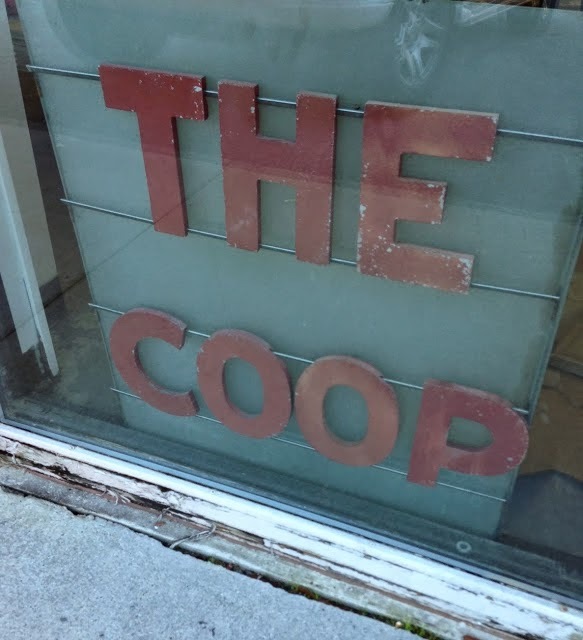 I will be painting at the Coop so... OUR DOORS ARE OPEN. 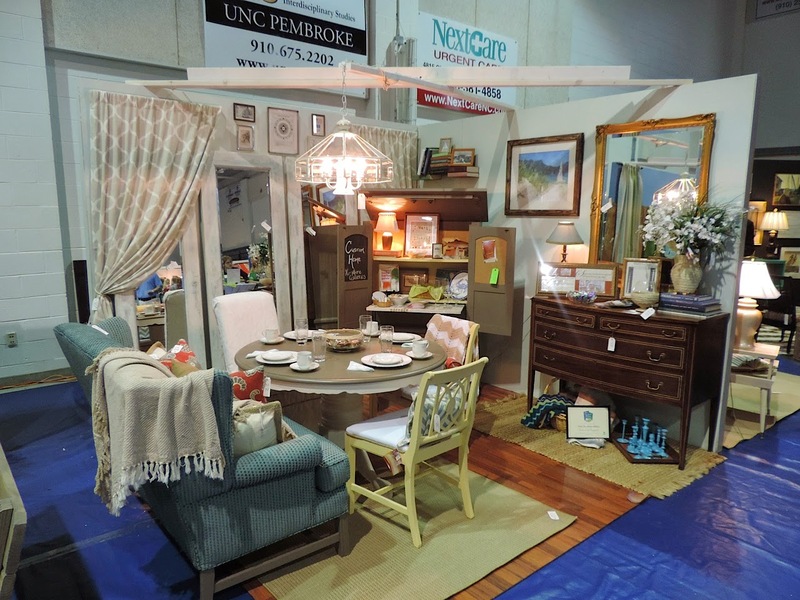 Upscale Resale... Habitat for Humanity! 1. 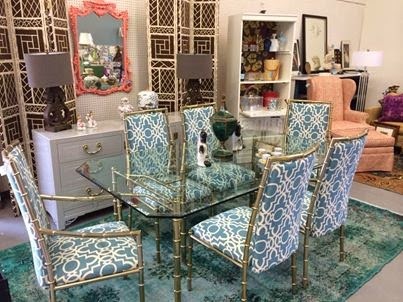 We got EVERYTHING at the Wilmington Habitat Restore. You won't believe what we found. 2. We have tricked it out and our stuff looks like a million bucks. 3. Mark your calendars for April 25-26. 4. 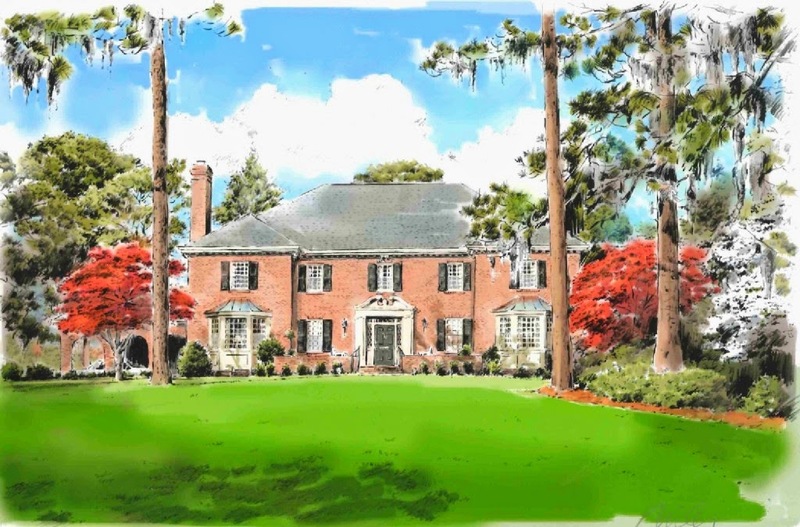 Everything is FOR SALE and all proceeds go to Cape Fear Habitat for Humanity. Be sure to check out what we do with our 10X10 space. 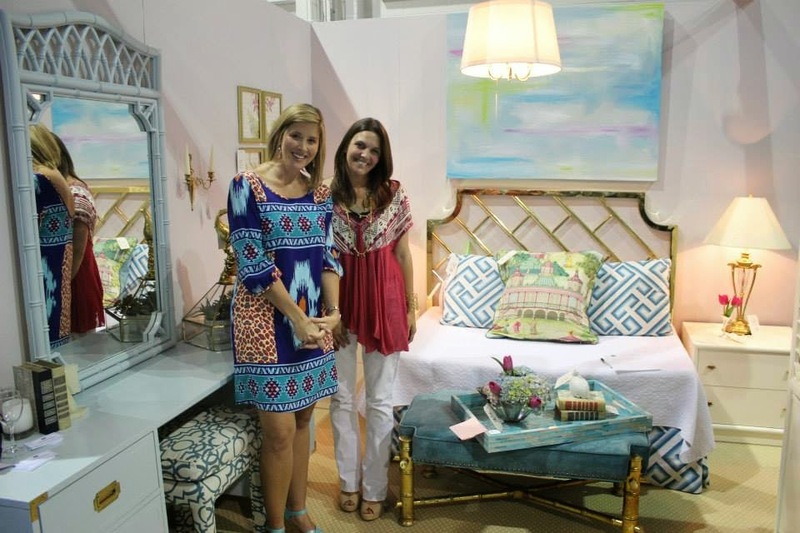 There are so many talented designers and we can't wait to see all of their finds and creativity at work. You will FLIP when you see what you can do with very little money. Habitat is wayyyy more upscale than you realized. See you there! We want to begin this post by saying our deepest sympathies go out to the Newsome Family here in Wilmington. On Friday, sixth grader Alex Newsome was hit in the head with a baseball during practice. Alex's injuries were severe and he passed away Friday night. This is one of those we can't understand tragedies and our community is still in shock from the news. Hug your loved ones and keep The Newsomes, Alex's coaches, teammates, classmates and friends in your prayers. 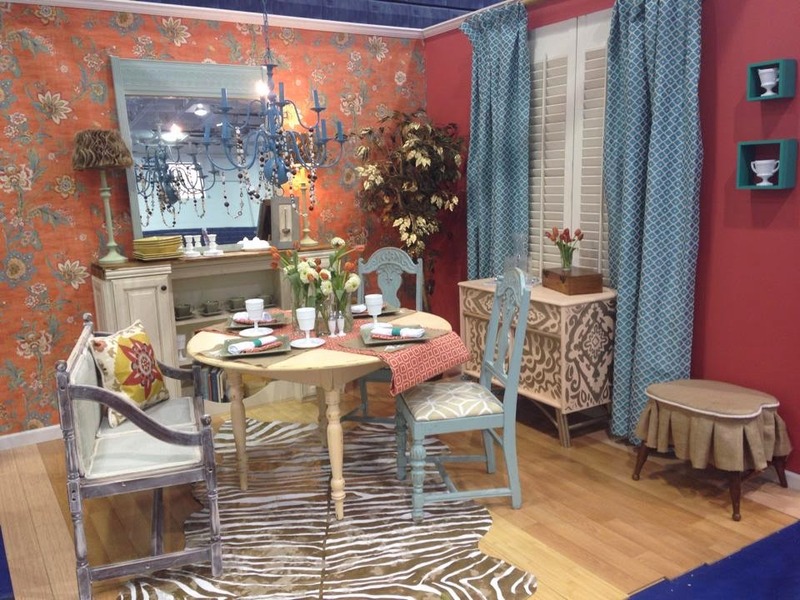 We are decorating the entry to Designer Show house! Included in our space is a custom Chinoiserie wallpaper that we designed (donated by Port City Signs and Graphics), a gorgeous Oriental rug from the Gallery of Oriental Rugs, a fretwork lacquered console, a coral Hollywood Regency chandelier and many other stunning pieces. Oh yeah, and in case you missed it and forgot to visit us while we were in the looney bin, a hand-painted leopard runner. Painted by, yours truly. 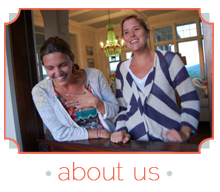 Like us on Facebook for sneak peeks of our space. 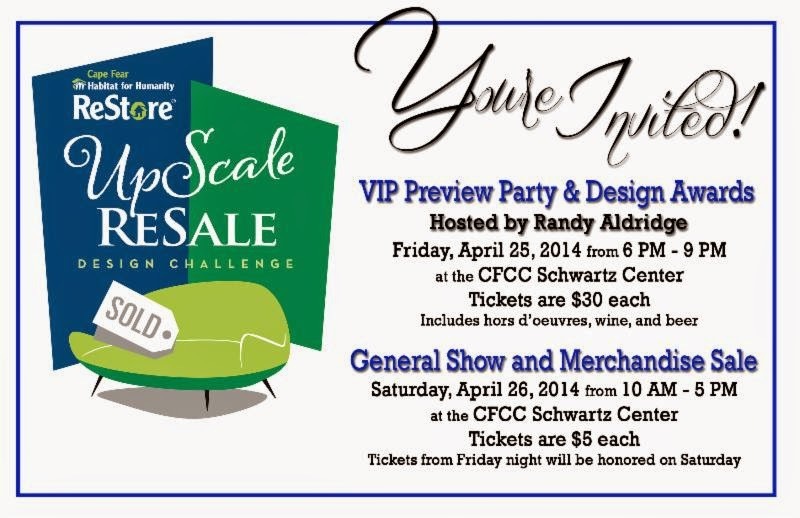 Did we mention that many of the items in the show house will be FOR SALE? 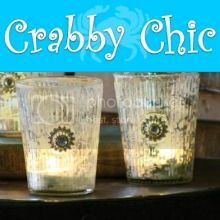 A portion of the proceeds go to the Arts Council of Wilmington. You don't want to miss it so MARK YOUR CALENDARS! So.... go to the Azalea Fest Parade, eat a funnel cake and think of moi, drop kids and hubbies off at home, and.... Come hang at The Coop! 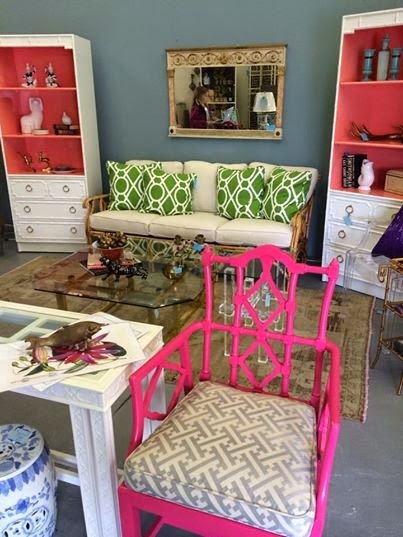 I spy with my little eye some new FAB pink chairs... and what are those in the background??? Yes, freshly lacquered matching shelves in white and coral... swoon! 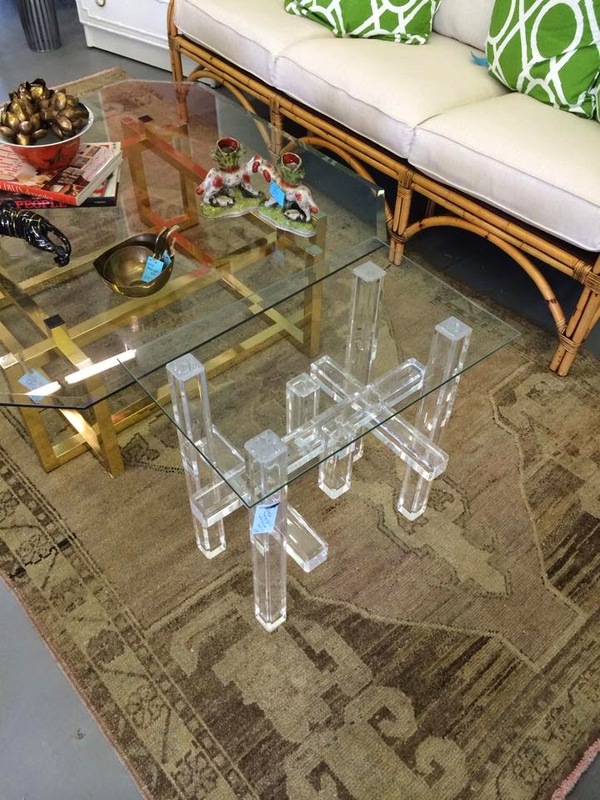 You might not be able to see it but yes, that is a vintage Lucite skyscraper table- who needs it? 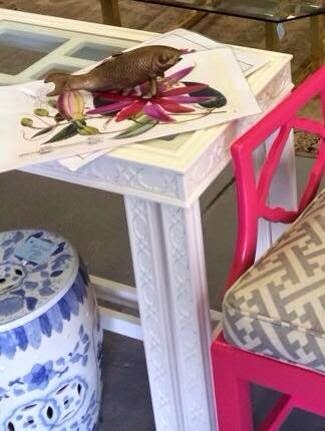 And check out the brass coffee table as well... LOVING THEM BOTH! Come see us Saturday from 12-3! Guest House Makeover at Bald Head! 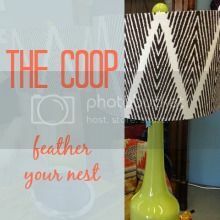 Don't forget that The Coop is open TODAY (Wednesday, April 9)! Stop by for a glass of wine for Hen Night In from 5-8pm. I just recently finished a "crofter" at Bald Head Island. It's a guest house with three bedrooms and 2 baths. 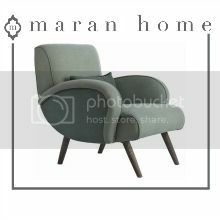 The client wanted comfortable and coastal, but most importantly, something that would wear well with lots of guests and family visiting. Just in time for Spring, Ann and I went to Bald Head for the installation (ok, so it was rainy and cold, but still a great trip). 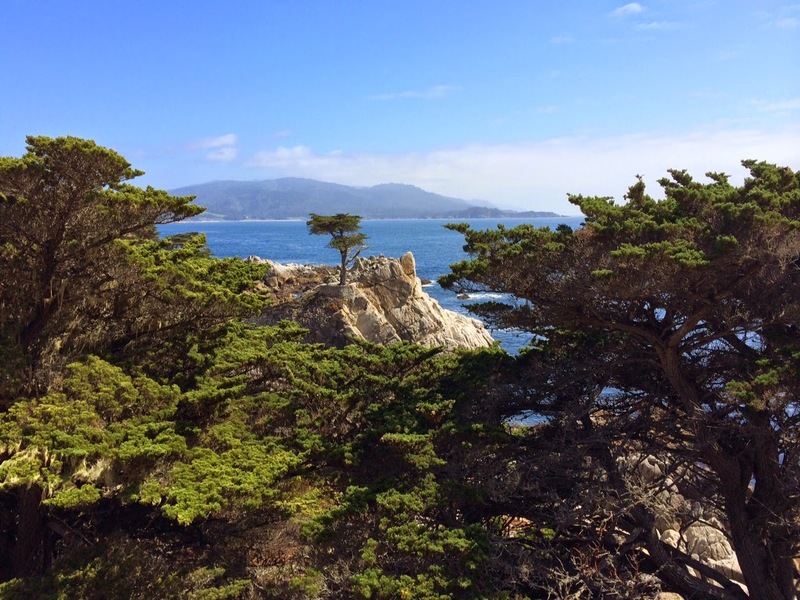 Just two days after Jim's wedding, I could hardly wait to go back. I was so excited to be going back to Bald Head for work -- seriously? It doesn't get better than that! The sconces are from Pottery Barn, however, the client's friend added ancient live oak paneling from a Bald Head tree. It was a great design solution that incorporated a piece of history from the island as well as a a budget friendly way to create some cool, unique lighting. The house has blue Corian tops in the kitchen. The tops date the kitchen a little, but it was too costly to rip out the tops and bring in new ones. 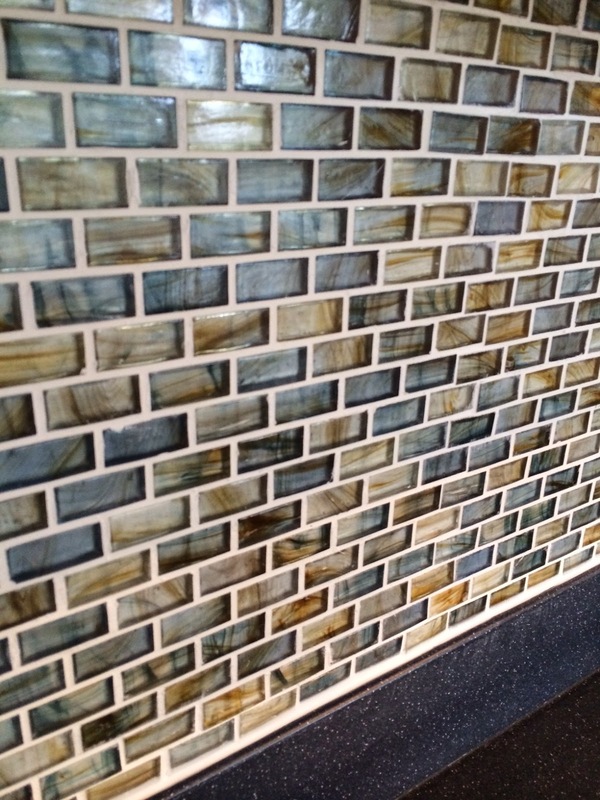 We added a glass tile that incorporated the blue from the top and the brown tones of the cabinet. The master bedroom got a makeover in turquoise and orange. The custom bedding was the jumping off point and the colors pop against the white walls and trim. The lacquered bedside tables were the client's mothers. She teared up when she saw them come off the truck. It is always so great when sentimental pieces can be incorporated. A large chair and ottoman (slipcovered) create a cozy reading nook. The seaglass floor lamp is a HomeGoods find. With lots of guest, the bedrooms serve as overflow from the main house. The grandchildren have their own space in this bunk room with a nautical vibe. 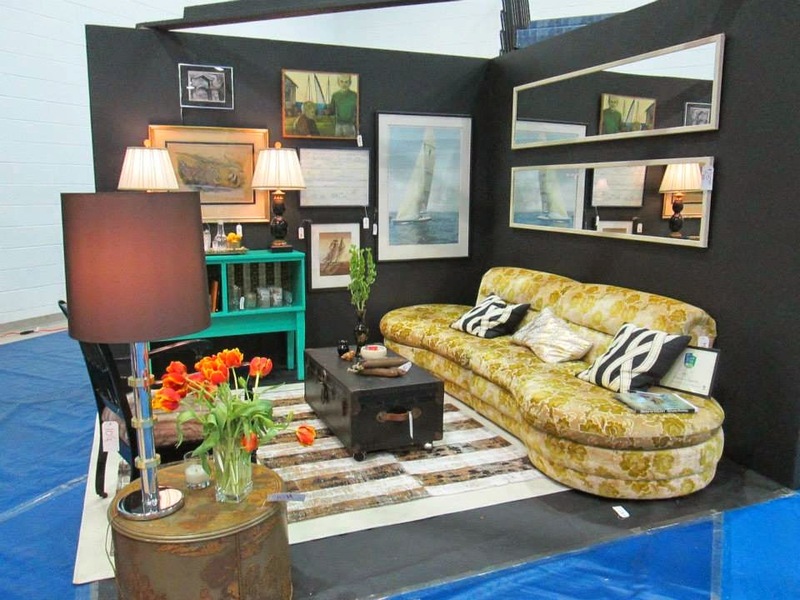 Antique sailing art grace the walls and an Overstock rope rug makes a statement against simple quilts. The last room is cherry and bright with pops of yellow and gray. 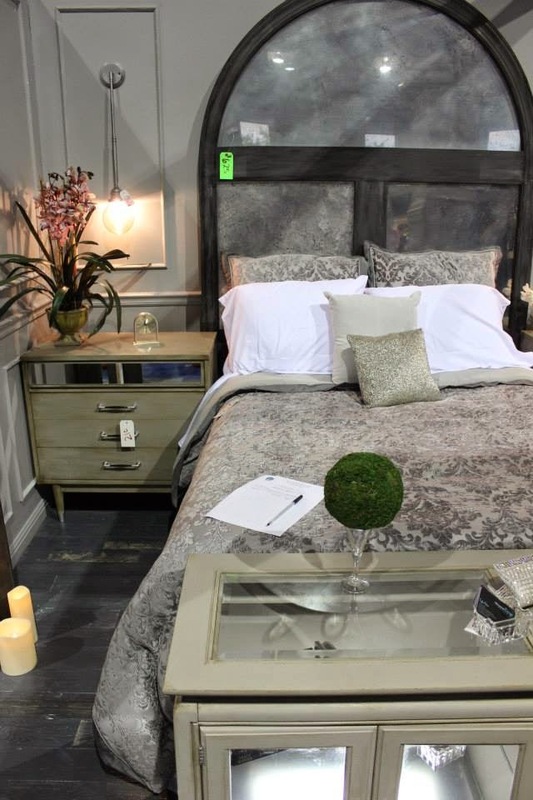 The family antique bed is the perfect backdrop. The "crofter" is comfy and ready for a summer full of family and friends! 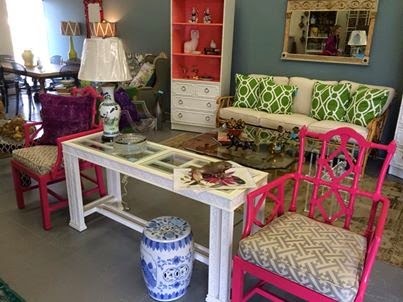 Don't forget to stop by the Coop for a glass of wine and great finds!